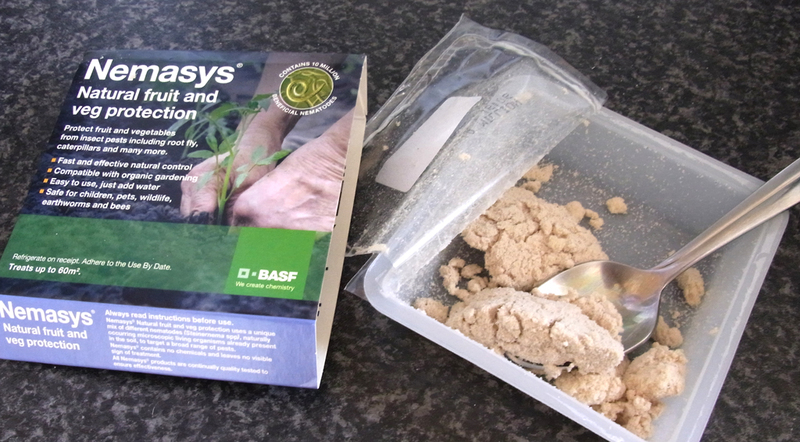 Nematodes – what’s not to like? When tackling the garden pests which can plague the vegetable growing season, we often focus on the big hitters: slugs, pigeons, squirrels.. But for me just as much damage can be done by the tiny crawling creatures which live deep in the soil. I’ve lost whole crops such as radishes to them, the produce ending up riddled with burrowed holes. So this weekend I applied a course of these fruit and veg-focused nematodes. 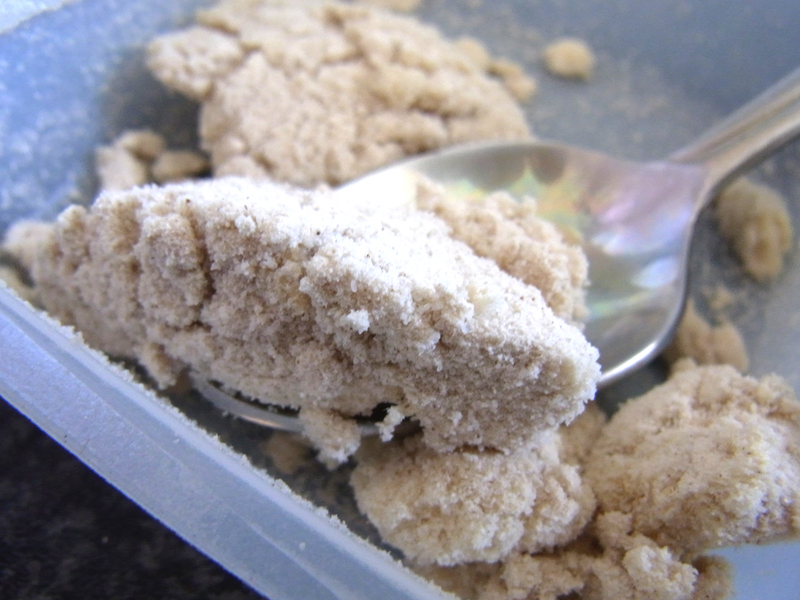 Mixing the light spongy mixture with water brings the microscopic worms (the nematodes) to life. Watering the soil inundates it with millions of them and they instantly go hunting for the dreaded carrot root fly, cabbage root fly, ants, thrips and others. With all the raised beds treated, I hope there’ll be less of a menace this year. Next week I’ll be applying the more famous anti-slug version too. It’s been incredibly effective here in previous years. I was driven to apply the nematodes by the recent attack on my Spagna Bianco bean plants. With a multi-pronged attack on that small raised bed, the straggly plants have made a good comeback. Close up, there’s strong leaf growth coming through. 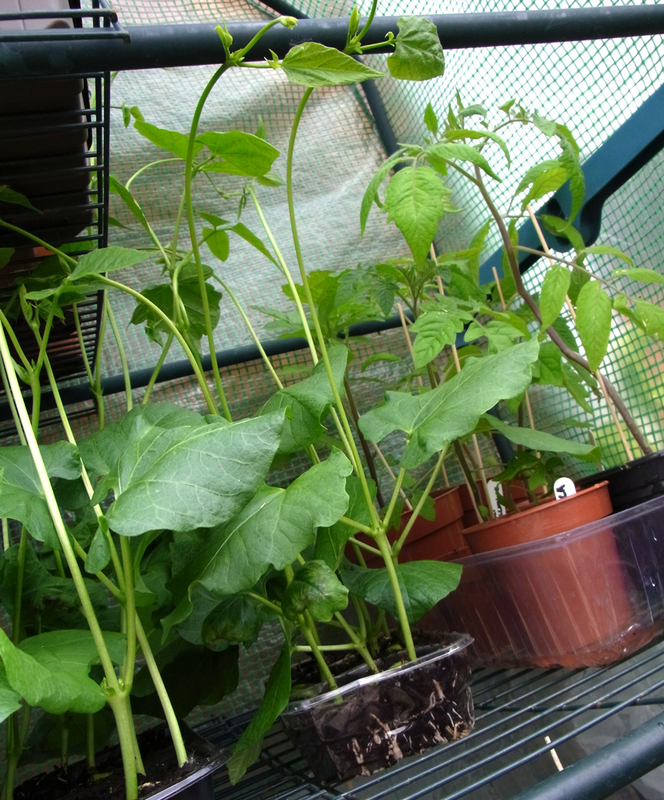 I sowed extras to fill the gaps and, indoors then in the plastic greenhouse, they’ve rocketed up. 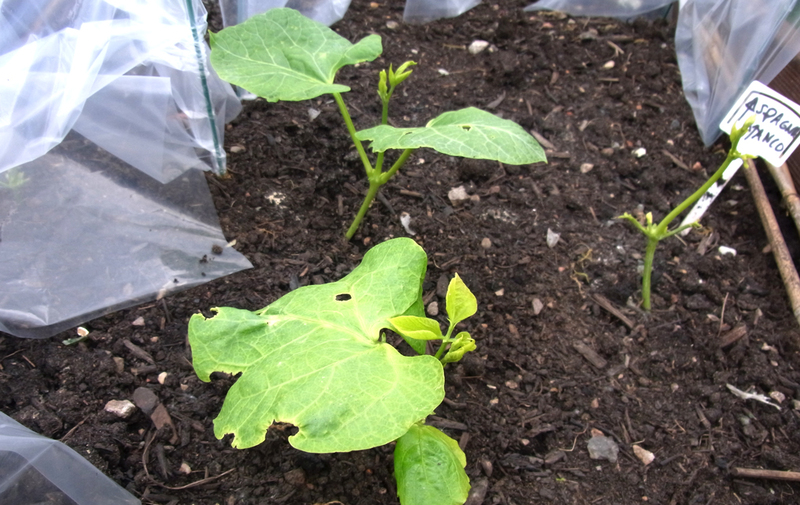 A few more days hardening off in the open air and I’ll plant them next to the recovering ones. Maybe those beans learned the fast growing habit from the Yard Long Red Noodle beans which shot up a week ago. They’ve slowed down since, sitting in the greenhouse with fairly cool temperatures during the week. 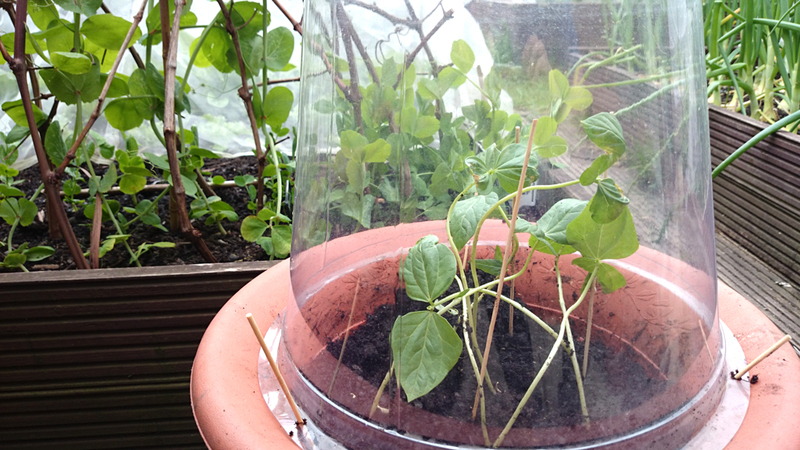 Today they’ve gone into their final pot, with a cloche over them for now. 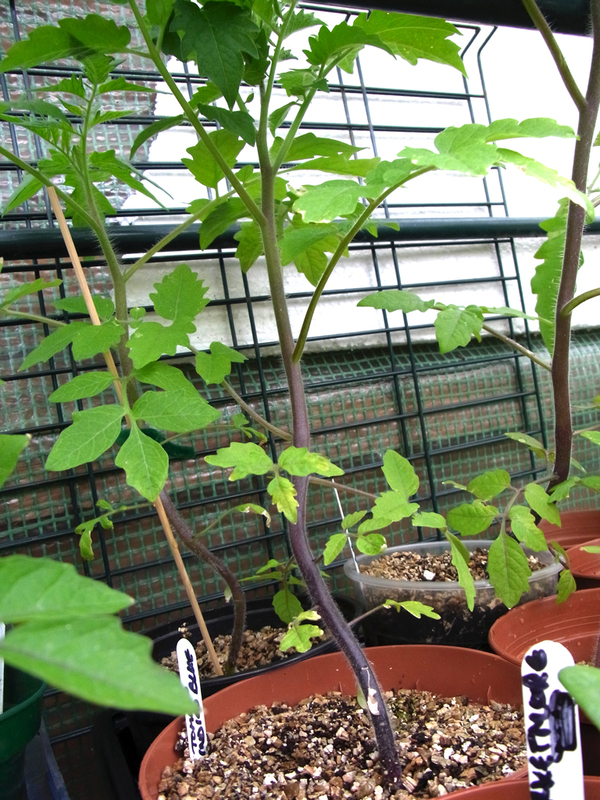 They’re leaving behind my tomato plants, which are all coming along well. I’m growing four varieties this year: Tigerella, Indigo Blue, Andine Cornue and Tiny Tim. I’ll be taking the Tiny Tim plants to work soon, to live on my desk and give me fresh cherry tomatoes with lunch each day. But I’ve been most impressed by the Indigo Blue plants: they’re growing vigorously and their stems are very woody and strong. 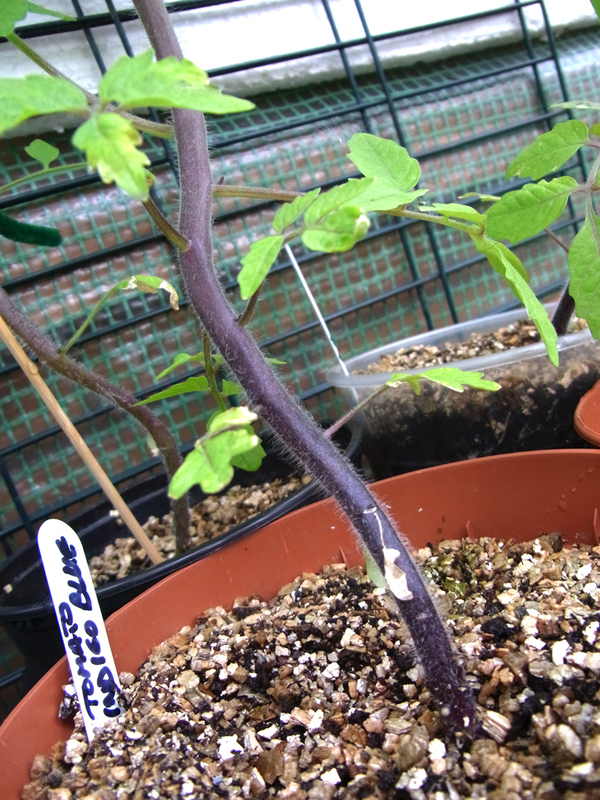 And best of all, in line with the eventual colour of their fruit, the stems are a delightful dark blue colour. 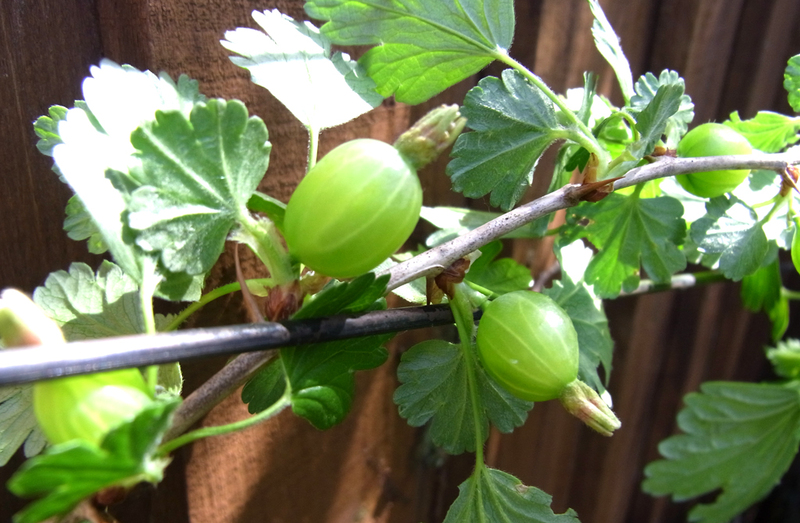 At the other end of the garden, my young gooseberry bush is now fruiting. It definitely benefited from a layer of well-rotted manure around its base a few weeks ago, a technique which seems to work wonders with fruit bushes and trees. Coupled with the slowly warming weather, fruit and vegetables alike are having a good month of May.